Notching his third victory on the Croft Circuit North Yorkshire, the 2010 Class 2 champion Chris Dyer from West Yorkshire kicked off the first of the double header weekend of the Porsche Club GB Championship with a win in Class 2. 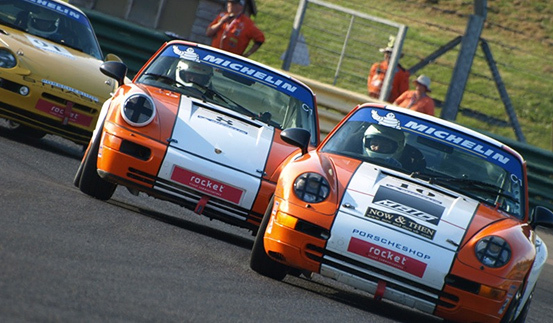 After winning the season-opener at Silverstone he repeated his success on Saturday in the Porsche 944 S2 911 fielded by Strasse Racing. 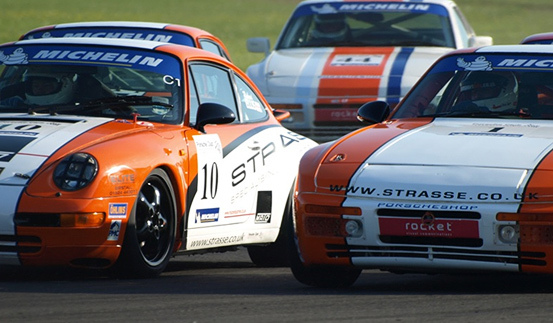 From the dogged battle for positions in the midfield for Class one, David Botterill came from 8th place on the grid to take an impressive 4th place in his Porsche 968 C2. Botterill also competing in the 39 car line up of the DDMC Championship Class A1 in the Porsche 944 on the same day putting in a strong performance taking first in class and second place overall only 2.110 seconds behind the Lotus Elise of Jef Wilson. Botterill kept the Seat Leon Cupra of Andrew Morrison at bay who looked the faster car of the two in the corners, but Botterill's top end speed just had the edge to take 2nd place. Chris Dyer made Four from Four in the blistering heat at Croft North Yorkshire, despite a late night fixing the problem with Chris Whittle and Paul Ward's car Chris still managed to convincingly take the chequered flag in Class two. During the first two laps Chris kept the pace mixing it up with the class one cars showing that he will be more than competitive should he decide to move up to class one in 2012, Dyer with a best speed lap of 75.723 came home well ahead of second placed Anthony Oliver in the class two Porsche 911 SC. In Class one Mark Stumpter made it four wins out of four with Mark McAleer taking second place followed in third by Peter Morris but it was David Botterhill and Richard Ellis who put on a show for the spectators at Croft with there mid-field battle, although they where unable to catch the leading pack the pair raced there bright Orange and White Porsche 964 and 993 bumper to bumper almost exchanging paint work at times. Botterhill who had just finished an outstanding drive and with a little help from the safety car in the DDMC event came from 20th on the grid to finish 3rd, Botterill who came 2nd in the DDMC race on Saturday had to start in 20th place due to a lack of qualifying time, but he soon battled his way to the front making an average of 4 passes per lap. But there was no time for celebrations, infact Botterill had no time to collect his trophy on the podium, he had to quickly change cars in order to start the Club Championship race...it was a mad dash from the paddock to the holding area leaving Botterill hardly any time to catch his breath. During the GT3 race on Saturday new-comers Paul Ward and Chris Whittle crossed the finish line with a major engine noise and low oil pressure. It was apparent there and then that the car would not make the starting grid for the Porsche Club Championship race and also looked doubtfull for the race on Sunady. Chris Dyer came up with a plan to return the car to the Strasse workshop in Leeds and repair the car for the next day...aginst all odds all three managed to strip down the bottom half of the engine, replace the Oil Salvage Pipe, put back together and have the car returned back to Croft for 9.30 the very next day. Below David Botterill make a quick change from his DDMC Porsche 944 into hi Club Championship Porsche 964 C2.